Eye makeup is my favourite part of all makeup looks. Eyes are so beautiful, and you can actually change the impression you give just by using a little makeup as well as manipulate your eye shape with eyeliner and other subtle tricks. I have eyeshadow palettes spilling out of my desk and makeup bags, far too many for a normal human being, but I'll admit it now that I am utterly obsessed. My most-used and versatile palette is the Lorac Pro Palette, but although it's gorgeous with a great and balanced selection of shadows. 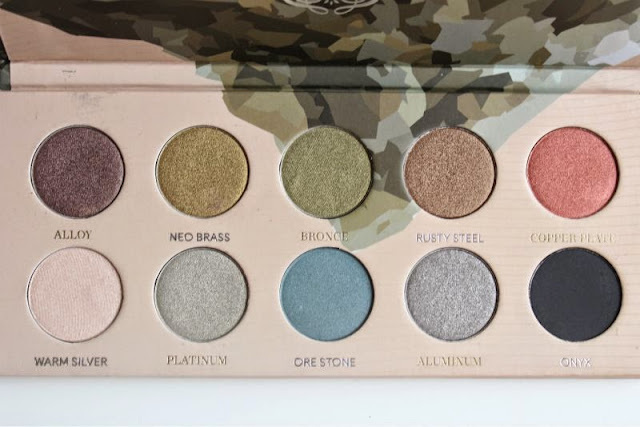 Honestly, my favourite palette is one I don't use very much and it is the Zoeva Mixed Metals Palette. I only apply these exquisite colours when I am attending a wedding or some fancy ball. They are creamy, soft, and easy to blend. The colours are unique and incredibly pigmented, they swatch like a dream and last longer than any eyeshadow formula I have ever tried. You can tell buy these swatches that there is something exceptionable about these shades, they are very hard to dupe and the colour payoff is insane. Indian weddings and clothes are full of colour and so vivid, I would recommend this palette to anyone who likes bright colours and high quality eyeshadows. Although bright, these colours are not loud or garish, they are simply stunning and very wearable. Thank you for reading, stay tuned for two more posts today as I attempt to catch up with the August Beauty challenge. Please comment and share your favourite eyeshadow palettes with me.